JUBILEE 1935 -- SILVER JUBILEE GEORGE V - OMNIBUS 1935 --. NL 80 SNS B0873704878 BIC NR. 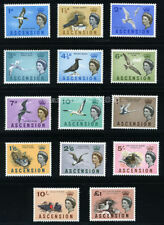 ASCENSION 1976 SET, BIRDS, 16 VALUES TO £2. M.N.H. Outstanding set 1p to £1, values are bright, fresh, crisp with lovely illustrations and fine detail and M.N.H. S.G. 199 - 214. Ascension, British colony, 1938-1953, Stanley Gibbons, # 43b (perforated 13) - 45 (perforated 13 ½) - 47b (perforated 13) mint MH, # 45 tiny spot on the front, VF / XF. = MH = neuf avec charnière / mint hinged. ASCENSION 1971 SET, DECIMAL CURRENCY. L.M.M. Super set, values are bright and fresh with good colour, gum & fine detail and mostly L.M.M. S.G. 135 - 148. ASCENSION 1991 MARGINAL SET, FISH, 15 VALUES TO £2.50. M.N.H. An outstanding marginal set 1p to £2.50, all as bright and fresh and crisp as when issued and M.N.H. S.G. 554 - 568. THE TOP LEFT STAMP. ALL MINT NEVER HINGED WITH ORIGINAL GUM. BUT THERE IS ONE TRACE OF HINGE ON THE SIDE MARGIN WHICH IS SLIGHTLY TOUCHED. The Scott #'s in this lot follow: 40,41,41A. ASCENSION THE 1938-53 GVI SET OF 16 FRESH LIGHTLY MOUNTED MINT (SEE SCANS). Ascension 1924-33 set SG10/20 fine MLH/MM cat £350 - most MLH, most have very slightly creamy coloured gum. MLH/MM (etc) - a mix of MLH and MM with the majority being MLH. MLH - Mint Light Hinged - lightly hinged no hinge remainders. Includes 1971 & 1976 definitive sets. Ascension SG 10/18 1924/33 set to 1/-. Fine mounted (hinged) mint except for the 1d & 2d which are used. (SG Cat - £229). ASCENSION THE 1934 GV SET OF 10 MOUNTED MINT (SEE SCANS). 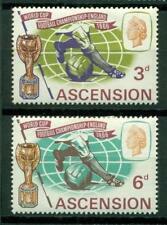 Ascension, British colony, 1938-1953, Stanley Gibbons, # 46 (perforated 13 ½) mint MH, XF. = MH = neuf avec charnière / mint hinged. = MNH = neuf sans charnière / mint never hinged. - tous nos lots sont envoyés en recommandé. ASCENSION SG41aa, 2d black & red-orange, M MINT. Cat £425. MOUNTAIN FLAW. QEII set Scott 75-88 Lightly Hinged. MLH/MM (etc) - a mix of MLH and MM with the majority being MLH. MLH - Mint Light Hinged - lightly hinged no hinge remainders. FU - Fine Used. VFU - Very Fine Used. MNG - Mint No Gum. MVLH - Mint Very Lightly Hinged - almost invisible signs of having been hinged. Other catalogue numbers may be quoted if known and these will be clearly marked to avoid confusion. Ascension 1938-53 1.5d rose-carmine SG40db cut mast and railings lightly mounted mint stamp, cat £130. 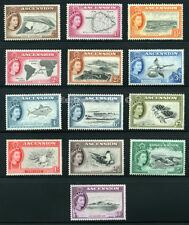 Ascension 1938-53 George VI Complete set SG 38b-47b Mnh. SG 38b-47b. 1938-53 George VI Complete set 16v. Ascension 1938-50 George VI Complete set with all perfs 32v. SG 38-47a Mint. 1938-50 George VI Complete set with all perfs 32v. 1½d shade SG 40e. (Cat £636.00 2019 SG Part One). in this set are slightly more toned than normal. 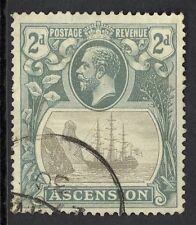 Unusual usage of Type V Cachet from Tristan to Ascension Island with the 20c due marking. AE028_007. = MNH = neuf sans charnière / mint never hinged. - tous nos lots sont envoyés en recommandé. = MH = neuf avec charnière / mint hinged. MNH - Mint Never Hinged. MLH/MM (etc) - a mix of MLH and MM with the majority being MLH. MLH - Mint Light Hinged - lightly hinged no hinge remainders. FU - Fine Used. VFU - Very Fine Used. MNG - Mint No Gum. Year of issue: 1924. Type: Single. Commonwealth & Empire. Collections & Mixtures. Condition: Used. Era: King George V (1910-1936). Price: £66.00. Ascension 1938/53 KGVI complete set of 32 values, includes all listed shades and perforations listed in SG catalogue, very fine mint, many are unhinged/unmounted mint, scarce so fine complete. SG 38-47a. An extensive pre-decimal to decimal QEII stamp collection. All fine mint with most mint never hinged. ALWAYS HAPPY TO COMBINE LOTS make Supersized seem small. Applicable Costs Will Be Added To Invoice. 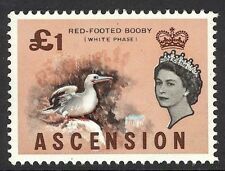 Ascension 1956 QEII set complete MLH. SG 57-69. Sc 62-74. Ascension 1956 QEII set complete mint lightly hinged. Gibbons # 57-69. Scott # 62-74. Lot of 14 Ascension MH Mint Hinged / MH Remnants Stamps.